If you’re looking for the top tourist attractions in Sylhet then it’s boating, which is the most common and ultimate travel fun here. Also, it’s true that everyone love boat riding on the beautiful river and Sylhet is a much preferable place for them. So, Sylhet is a must-visit travel destination for you if you love nature and enjoy boating. It will lead you to enjoy the top tourist attractions in Sylhet, Bangladesh as boating is the common activity. If you want to know about Sylhet then it’s about 250 kilometers northeast of the capital Dhaka and the most northeastern division in Bangladesh. With border crossings in the north, east and south, it’s almost completely surrounded by India. If you want to go there to enjoy the top tourist attractions in Sylhet then you have several daily flights from Dhaka with US-Bangla and NovoAir. Although the flight from Dhaka to Sylhet is only 30 minutes in a propeller plane, traveling can take up to a couple hours because of the delays. And you’re able to find flights from London and Dubai as there are also international routes serving Sylhet Bangladesh. Apart from that, you can travel from Dhaka to Sylhet by buses and trains as well. 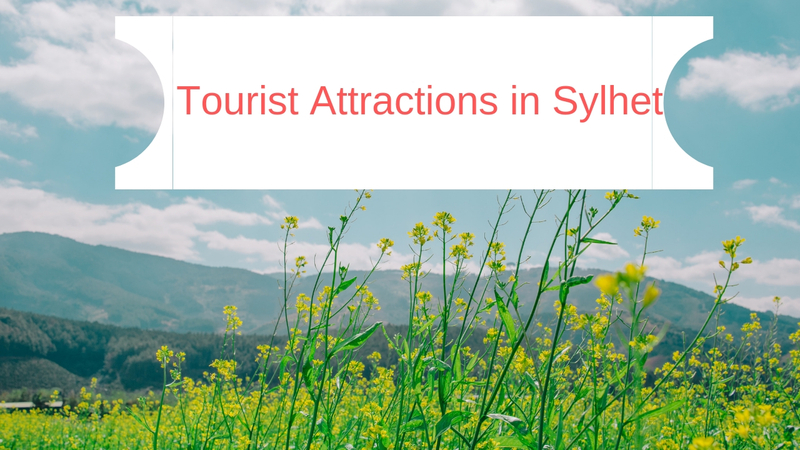 What are the Top 10 Tourist Attractions in Sylhet? It’s a hidden treasure of tourist attractions in Sylhet that may take several days to complete if you want to see them all. From the Ratargul Swamp Forest to Rema-Kalenga Reserve Forest, there is high land and what do you find that it doesn’t have? You may already read about Ratargul Swamp Forest that should make an attraction for this most beautiful and yes this is one of the top tourist attractions in Sylhet. It’s amazing while you’re entering into a beautiful natural freshwater swamp forest by boat. It’s covered with various types of water plants and its total area is almost 504 acres. If you want to explore the extreme beauty of this forest then you should have a boat ride. The area is not only filled with amazing greeneries and the tranquility around but the whole forest is connected with the Gowain river and the Chengir Lake. It will take you to the beautiful destination Bisnakandi when you’re on a long journey by an engine boat on the beautiful Piyain River. Also, it can be your memorable experience while you’re in a boat ride on the river Piyain. The mountain views around this destination along with the rural landscape will make extraordinary feelings in your mind. Apart from these, the crystal clear water and rolling stones are the main attractions here. Although many travelers enjoy bathing, be careful if you don’t know swimming. You also can go to Panthumai with a boat ride on the river Piyain and the top attractions here are the Borhill waterfall. Despite being not the part of Bangladesh for the transboundary river Piyain, Panthumai became popular among tourists in Sylhet. As the beauty of the entire destination is just outstanding, it’s one of the top tourist attractions in Sylhet. Because of the color, which is emerald green of the water, Lalakhal became one of the top tourist attractions in Sylhet. The canal is so beautiful that you can’t take away your eyes from the water. Also, you’ll definitely love to take a short boat ride on Lalakhal. In fact, the main source of this water is the beautiful river Sari that’s originated from the State of Meghalaya in India. These all made it beautiful and attracts a lot of visitors daily. Although Lovachora is a bordering area from Kanaighat Upazilla in the eastern part of Sylhet district, it’s somewhat fortified from northeast to northwest by the Meghalaya ranges. Besides an age-old tea garden, it’s essentially a quarry where stones and boulders are mined. If you want to visit Lovachora then it involves a boat journey from Kanaighat Sodor. And it will soon reach the confluence of three rivers as the boat moves east. The Borak and the Lova meet at one point, assume the name Surma and flow west towards Sylhet city as they are flowing respectively from the south and north. Jaflong is still one of the top tourist attractions in Sylhet despite the loss of its former splendor due to unrestricted mining and crushing of stones. The river Dauki enters Bangladesh under the name ‘Piyain’ flowing from the north Khasi mountains. And Jaflong is in the East Jaflong Union under Guainghat Upazilla, which is about 62 km north-east from Sylhet city. If you want to see the beautiful hanging bridge over the Dauki then you can hire boats to go to the Zero Point. Apart from being a land custom and immigration check post, there is a war cemetery of the 1971’s freedom fighters. Situated in Laurergorh under Tahirpur Upazilla in Sunamgonj District, the Jadukata is one of the most beautiful rivers in Bangladesh. This river flows from the Meghalaya ranges and it was previously called the Renuka. Beside this river, the shrine of Hazrat Shah Arefin (R) is situated. In the rainy season, there is a spectacularly visible behind the shrine is a waterfall. Also, there is a church behind the river and is a beautiful hill popularly known as Bariker Tilla. Dolura is yet another tourist attraction, which is not far away from Sunamganj town. It’s just past the village Narayontola, kissed by Meghalaya ranges where indigenous people live. From one side together with its sandy banks and crystal clear water attract tourists the high hills and the river Cholti flowing. The largest stone quarry in Bangladesh is Bholagonj, which is 33 km away to the north from Sylhet city. The rivers Dholai and the Piyain meet at Companigonj Upazilla Sadar, flowing respectively from the Khasi hill in the north and Dauki in the east. It’s a place that boasts of rows of hills, rivers, falls and quarries, just six kilometers from there is Bholagonj. After the Sundarbans, Rema Kalenga is the largest natural forest. This is a dry forest has been declared as ‘Reserve Forest’ by the government, which is a sanctuary for wild animals. And Rema and Kalenga are closely connected despite being two different forests. Also, tourists will be greeted by indigenous communities such as Tripura, Munda, and Oraw who have been living there for ages, besides the deep forest and wild animals.